When beginning to think about this page I had no idea at all what to write. I find it very easy to write about other people’s lives but can’t think of anything interesting to say about my own! So here goes… When I’m not writing or lost in a daydream thinking about what I’m going to write, I work, mostly. I work in the construction industry in a specialist field and own a small company, this may sound dull but it’s actually nowhere near as exciting as that! On a much more positive note I live with my wife and four crazy dogs in a beautiful mountainous part of Britain. My true loves, apart from the above, are history, palaeontology and music. My love of writing fiction is fairly new, although it has always been in the back of my mind as something I’d like to explore. Now I can’t get enough, and often write when I really should be sleeping! Survive was written mostly in the evenings whilst working away from home over about a three month period in summer 2017. It takes a long time to get a book to print and you have to check absolutely everything yourself – most of the effort will be yours – but if you fancy writing, don’t let that put you off. It is a really great feeling to have your first book come together, especially if you are brimming with ideas for other works. There are several other projects already simmering away in the background here, whilst I get the New World Trilogy finished. Irritatingly though, I have also come up with concepts for two more books in this series – so it may become a 3+2 trilogy. Oops. Firstly, I would say the late, great Terry Pratchett has a lot to answer for in helping me develop my own ridiculous style. I think he really showed that it’s often OK to write something with an obliquely serious message, whilst extracting the urine! He made the world a better place and I really miss his work, energy and wit. Secondly, the extraordinarily prolific Bernard Cornwell. I particularly love the Saxon (Uhtred) saga. His disdain of the establishment is always a pleasure to read. Thirdly, I think I would have to say Robert Harris. His skill in bringing ancient Rome to life is just sublime, especially the Marcus Tullius Cicero trilogy. The third book in this series must have been incredibly difficult to write, but to read it’s a pure joy, sad ending or no. These books have little of the ‘blood and guts’ that many in the genre describe but show as much gravity, excitement and intrigue as anything else out there in my opinion. Fourthly, I really admire the works of CJ Sansom. The Matthew Shardlake chronicles are some of the darkest and most gripping books I’ve ever read. Set in the middle of the religious strife of the 16th century; who needs horror when our history is so terrifying? Now, you may well ask, where’s the sci fi? I do love sci fi and have dozens, probably hundreds of books in that genre but, depending on my mood, I usually prefer to read history if I’m honest. You may well now ask, so what did you start your writing career with sci fi for then, you numpty? And that’s a good question. Whilst writing this I had to ask myself, why did I? I hadn’t honestly considered it before. I think the answer is that I thought I could approach sci fi from a different angle and that it would be interesting, given my other influences, to see where this led. The power of sci fi is that it’s limitless and can go anywhere or anywhen. 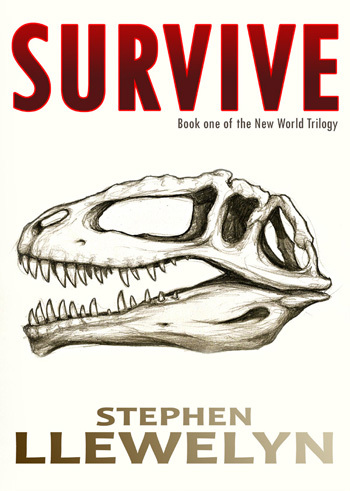 The New World books may appear to be about spaceships and dinosaurs superficially, but really they are about creating a new society from scratch and people failing to get along, whilst also dealing with a lunatic fringe who want to reboot the human race and erase most of it! The idea of fighting over a dark, dystopian future, which is terrifyingly close, from a hundred million years in the past felt about as extreme as it could get. However, I honestly believe that the end result is surprisingly believable – but I’ll let you be the judge of that.